Staring at sound. 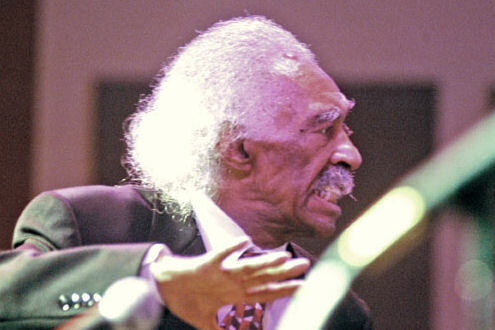 I saw Gerald Wilson do just that a couple nights ago, staring right into the bell of a screaming tenor sax. Kamasi Washington was blowing like a freaking hurricane, just roaring, and Gerald stood maybe two feet in front of him, letting that crazy dangerous torrent of notes wash right over him. He watched and counted time almost invisibly, nodding ever so slightly for another chorus, and another, and another. Kamasi was loud, a big huge room filling sound, and Gerald, 95 years old, never flinched. I was sitting a few feet away, with a profile view of the scene and wishing so bad just then that I was a photographer and not a writer because I could see the picture, still can, and if I had taken that picture I’d stick it right here and cut out a thousand words. But all I have is that image burned into my brain, as perfect a jazz image as I’ve ever seen. And one I’m not likely to see again, not so close, not so perfectly framed. Gerald comes from a different time. This entry was posted in Jazz and tagged Gerald Wilson, Kamasi Washington. Bookmark the permalink.